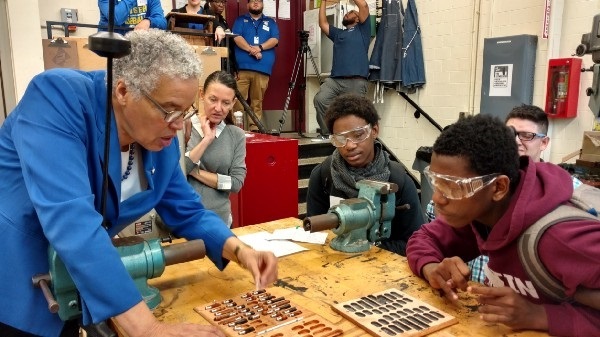 On October 5, President Preckwinkle met with students enrolled in Austin College & Career Academy’s manufacturing program to celebrate Manufacturing Day. The national day showcases modern manufacturing and serves to inspire the next generation of manufacturers. Jobs are lifesavers, and her hope is that young people in Chicago contemplate their career options and seriously consider manufacturing. The program at Austin College & Career Academy is operated by Manufacturing Renaissance’s Manufacturing Connect (MC) program, which also operates programs at two other Chicago Public Schools. Austin College & Career Academy is only one of three high schools in Illinois accredited by the National Institute for Metalworking Skills (NIMS). This nationally recognized program provides young adults with career pathways into manufacturing through paid work experiences, training for industry credentials, career and college counseling, opportunities for dual-credit, mentoring and leadership development. MC has facilitated 514 work experiences for program participants, raised more than $6 million to support advanced manufacturing education and engaged over 105 companies in its work. Cook County provides grant funding to Manufacturing Renaissance for their groundbreaking work preparing youth with the skills required for today’s well-paying jobs in manufacturing. In 2017, the average manufacturing worker in the United States earned $84,832 annually, including benefits. For more information, please visit Manufacturing Renaissance, Chicago Metro Metal Consortium and Cook County Bureau of Economic Development .